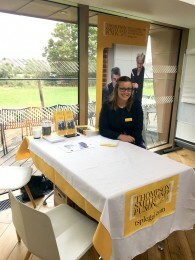 Thompson Smith and Puxon (TSP) were pleased to be part of the Pop Up Business Cafe at Firstsite today (29th June) organised by the BEST Growth Hub. TSP Corporate and Commercial Solicitor Caroline Nicholls was on hand to chat on a one to one basis with start-ups and growing businesses. Topics discussed during the morning were business ownership structures, commercial contracts, consumer protection, shareholder agreements and GDPR. The TSP Corporate and Commercial team has significant experience in helping clients from a wide range of business sectors. Clients range from start-ups and SMEs to family businesses and large PLCs operating in both local and national industry and commerce. Wide ranging knowledge and experience means the team is able to advise clients on achieving their objectives across a broad range of business activities and transactions. The BEST Growth Hub provide free support and advice to businesses in Essex, Southend and Thurrock. They aim to help businesses identify and realise their potential and offer a wide range of advice, training and networking. You can find out more about the business advice BEST Growth Hub can offer here.